This study implemented and evaluated the adapted Situation-Background-Assessment-Recommendation (SBAR) tool for use on two inter-professional rehabilitation teams for the specific priority issue of falls prevention and management. SBAR has been widely studied in the literature, but rarely in the context of rehabilitation and beyond nurse-physician communication. In phase one, the adapted SBAR tool was implemented on two teams with a high falls incidence over a six-month period. In phase two, process and outcome evaluations were conducted in a pre-post design comparing the impact of the intervention with changes in the rest of the hospital, including the perceptions of safety culture (as measured by the Hospital Survey on Patient Safety Culture); effective team processes, using the Team Orientation Scale; and safety reporting, including falls incidence, severity and near misses. This study suggests that the adapted SBAR tool was widely and effectively used by inter-professional rehabilitation teams as part of a broader program of safety activities. Near-miss and severity of falls incidence trended downward but were inconclusive, likely due to a short time frame as well as the nature of rehabilitation, which pushes patients to the limit of their abilities. While SBAR was used in the context of falls prevention and management, it was also utilized it in a variety of other clinical and non-clinical situations such as transitions in care, as a debriefing tool and for conflict resolution. Staff found the tool useful in helping to communicate relevant and succinct information, and to "close the loop" by providing recommendations and accountabilities for action. 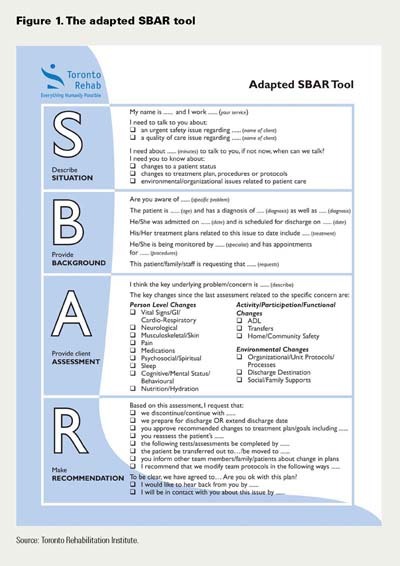 Suggestions are provided to other organizations considering adopting the SBAR tool within their clinical settings, including the use of an implementation tool kit and video simulation for enhanced uptake. The physical, psychological, social and economic consequences of falls and falls-related injuries have been well documented in the literature. Each year in Canada, approximately one third of healthy, community-dwelling older adults experience a fall (Registered Nurses Association of Ontario [RNAO] 2007). Falls in hospitals are almost three times this rate and account for up to 84% of all in-patient incidents (Halfon et al. 2001). There is compelling evidence, however, that falls can be prevented through timely risk detection and appropriate management. Numerous guidelines have emerged over the past decade outlining best practice for falls risk prevention and management both within healthcare settings and in the community (American Geriatrics Society, British Geriatrics Society and American Academy of Orthopaedic Surgeons Panel on Falls Prevention 2001; RNAO 2007). Inherent within these guidelines is the need for strong inter-professional team collaboration and communication. Communication breakdown has long been cited as the leading cause of inadvertent patient harm, including falls (Joint Commission on Accreditation of Health Care Organizations 2004). All too frequently, however, communication is context or personality dependent and influenced by a myriad of factors including gender, culture, profession and structured hierarchies within healthcare (Leonard et al. 2004). The Toronto Rehabilitation Institute (Toronto Rehab), a large academic rehabilitation and complex continuing care hospital, has embarked upon a novel patient safety strategy to improve team communication. In a pilot study, we adapted and implemented a structured communication tool – the Situation-Background-Assessment-Recommendation (SBAR) process – for use in a rehabilitation setting, with promising results (Boaro et al. 2010; Velji et al. 2008; see Figure 1 for the adapted SBAR tool). The SBAR tool is a situational briefing model that provides appropriate assertion, critical language and education to a safety issue (Leonard et al. 2004). While many organizations have implemented the SBAR tool, there is little evidence regarding its effectiveness beyond the acute care environment and nurse-physician communication. The pilot study offered preliminary insights into how SBAR may be used and evaluated within an inter-professional rehabilitation team. This current study builds upon our previous work in three ways: it implements SBAR on two rehabilitation units with high falls rates; it focuses team communication around the high-priority issue of falls prevention and management; and evaluates processes and outcomes specific to patient safety culture, team communication, and falls incidence and severity. This project had two phases: in phase one we implemented the adapted SBAR tool and in phase two we evaluated its processes and outcomes. The geriatric and the musculoskeletal rehabilitation units were chosen for this study. Both units are similar in size, admit similar patient populations (older adults with multiple co-morbidities) and have similar lengths of stay (ranging from 35 to 40 days). They are also comparable in terms of falls incidence. In the two years leading up to the study, falls on these units constituted 43% of all reported falls in our organization (excluding long-term care). Clinical and non-clinical staff members and leaders of the geriatric rehabilitation (50/55) and musculoskeletal rehabilitation (35/50) units participated in this study. Participants included health professionals who deliver direct patient care (e.g., health disciplines, nurses and physicians), as well as support staff who have a critical role within the unit (e.g., porters, housekeeping and volunteers). In both study groups, all health disciplines, physicians and unit leaders participated. The implementation of the SBAR process occurred over a six-month period. A series of three education workshops (a total of four hours) introduced staff to key elements of patient safety including communication breakdown in healthcare, a systems approach to safety culture, openness to reporting incidents and near misses and the use SBAR to facilitate communication. Role-playing using real-life case examples related to falls risk assessment, prevention and management was used to demonstrate how SBAR may be implemented in clinical situations. These scenarios provided participants with powerful feedback in learning how to apply the tool. Our previous work supported using local champions to reinforce the use of SBAR during the implementation phase and beyond. We also used a series of reminder tools including pocket cards, posters, telephone prompts and educational binders that were located strategically throughout the units. A member of the research team or SBAR champion also attended weekly team rounds as a way to further reinforce the use of SBAR, and to understand the situations in which SBAR was being used (or not), with whom and in what context. The three main outcome measures of this study examined staff perceptions of patient safety culture, team effectiveness and falls incidence, including fall severity and near-miss reporting. Outcomes were measured using a pre-post test design, and data from the study teams are presented in aggregate form. The process evaluation involved a multimodal approach that aimed to better understand the context and uptake of SBAR on the two inter-professional teams. Staff perceptions of patient safety culture were measured using the Hospital Survey on Patient Safety Culture (HSOPSC; Westat et al. 2004). The 43-item survey can be used to track changes in patient safety culture over time, as well as to evaluate the impact of patient safety interventions at both the organization and unit levels. The survey consists of 12 patient safety domains and has been found to be valid and reliable. All Toronto Rehab staff (n = 1,700) were sent the survey prior to the implementation of SBAR and approximately 12 months later. Response rates pre- and post-intervention were 31% (n = 520) and 33% (n = 569), respectively. The study teams had a response rate of 87% (n = 74) pre-intervention and 69% (n = 59) post-intervention. Surveys were analyzed using the "5% rule of thumb" as suggested by the survey authors; that is, results must be at least 5% higher or lower to be considered clinically significant. We also tested for statistical significance within the study units, as well as compared with the rest of the hospital, which served as our control group. Over the study period, the geriatric and musculoskeletal rehabilitation teams showed clinically meaningful change (using the 5% rule of thumb) in all 12 safety dimensions of the HSOPSC. Many of these improvements were greater than 10% and ranged as high as 28% in the Handoffs and Transitions dimension, which is an area of emphasis for the organization. Nine of the 12 safety dimensions were also statistically significant (Table 1). At baseline, the aggregated results for the study teams scored clinically lower than results for the rest of the hospital in nine of the 12 safety dimensions, and statistically lower in six dimensions (Table 2). Many of these dimensions were related to teamwork and communication. Post-intervention, intervention units scored clinically higher in four safety dimensions: Manager Expectations Promoting Safety, Organization Learning – Continuous Improvement, Teamwork across Units and Handoffs and Transitions. Two of these dimensions were also statistically significant. Table 3 examines these change scores in greater detail. It compares the changes within the study units and the control group pre- and post-intervention. While the organization showed some improvements in clinical (one dimension) and statistical scores (four dimensions), the study teams demonstrated clinically significant change in 10 dimensions and statistically significant change in nine. The Team Orientation Scale was administered to the study teams at baseline and following the implementation of SBAR. This scale measures team effectiveness and incorporates issues of team communication, team perspectives and valuing others, and is part of a larger questionnaire based on the cognitive-motivational survey by Millward and Purvis (1998). The survey and its domains have been found to be valid and reliable. Pre-and post-implementation, the study teams showed significant change in four of the 10 items, including items that emphasized effective and agreed-upon methods of communication, and a belief that participants' contributions were valued (Table 4). Falls incidence and severity, as well as near-miss reporting, were examined through our online reporting system. Severity ratings were categorized in four levels (no harm, minor, moderate and major) and tracked over an 18-month period, including the six months leading up to and following the study period. Both near-miss reporting and the number of major falls demonstrated an overall decreasing trend across both the organization and the study units. Conversely, total falls showed an increasing trend on the study teams. 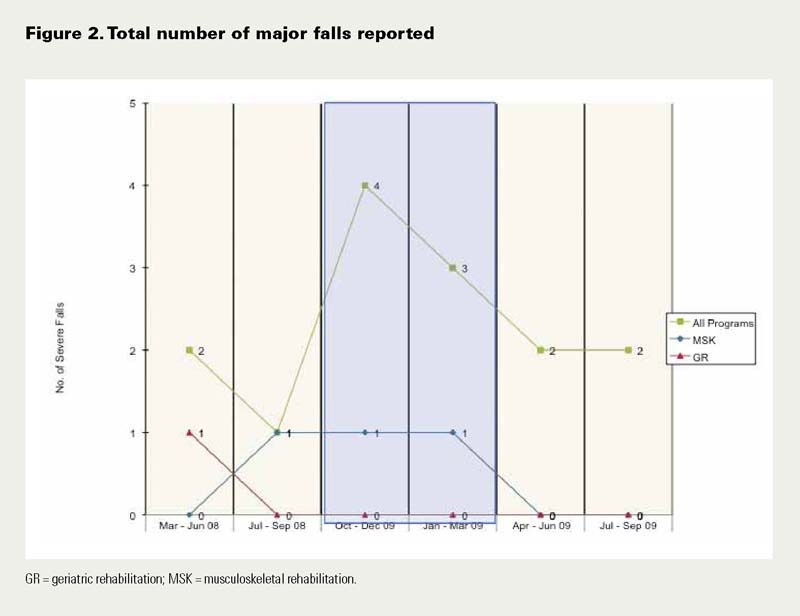 These data do not account for repeat fallers; nor do they consider whether falls increased on these units or if staff were simply reporting more incidents. 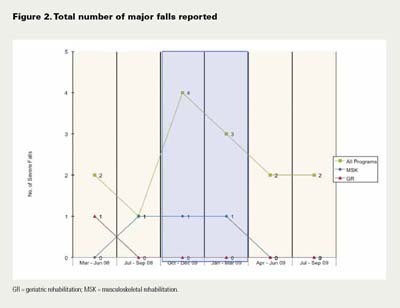 Figure 2 shows the total number of major falls, or falls causing serious injury, on the two study team units rehabilitation units compared to the entire organization. Process Evaluation: How Was SBAR Used? The aim of the process evaluation was to further explore the uptake (or not) of SBAR on the two inter-professional rehabilitation teams and to provide additional contextual understanding of our results. To do this, we conducted brief one-on-one interviews with all participants mid-way through the study. We also held focus groups (n = 18) on each of the study units at the end of the implementation period. Each focus group was conducted by two experienced moderators and was audiotaped and transcribed verbatim. These groups provided us with an in depth understanding of the enablers of and barriers to using structured communication on inter-professional teams. For example, at the beginning of the study participants regularly said to us, "We are good communicators. Why do we need SBAR? We do this already!" At the end of the study, however, this notion had changed. Many participants expressed that while they were able to provide the situation and background of an issue; they only sometimes offered their assessment and rarely made a recommendation. Three main themes emerged from this evaluation. First, staff used SBAR to communicate falls prevention and management; but they also used the tool in a variety of other clinical and non-clinical contexts, for example, as a debriefing tool and to discuss changes in team processes. Second, participants used SBAR in situations that they perceived to be sensitive or hierarchical in nature (e.g., when approaching their manager or during conflict resolution). And third, staff used the tool in urgent situations (e.g., changes in a patient's health status); but they also used it in a variety non-urgent situations, including changes in a patient's treatment plan and during transitions in care. Sustain the momentum. SBAR champions emerged naturally from the study teams and were an effective means to reinforce, encourage and model the use of SBAR. We also included clinical and support staff in both phases of the study, which made the SBAR process relevant to the entire rehabilitation unit and additionally recognized the key role that support staff play in patient safety within the organization. Finally, we found that reminder tools, such as telephone prompts and pocket cards were useful and widely utilized. Recognize the diversity of the SBAR conversation. We asked teams to structure their SBAR conversations around communicating the issue of falls risk and management (e.g., SBAR to communicate falls risk assessment, as a handoff mechanism at shift change to discuss falls issues or as a post-falls debriefing tool); however, staff also used the tool in a multitude of other urgent and non-urgent situations. Whatever the context, SBAR was not used randomly − staff consistently used the tool for what they perceived to be sensitive or hierarchical issues. Consider the value of context-dependent and relevant case examples to reinforce the value of SBAR during education sessions. We developed role-playing scenarios from clinical situations that were meaningful to the study teams, as an effective means to practise the SBAR process. We also built in evaluative and tracking mechanisms throughout the implementation phase that reinforced an iterative "learning-in-action" approach. This allowed us to refine the tool and our processes. Consider implementing SBAR in clinical environments with teams that may be underperforming. We implemented SBAR onto two teams with a high falls incidence. Implementing change initiatives, even pilot studies, on high-performing teams may be a lost opportunity. Staff found the tool useful in helping to communicate relevant and succinct information and to "close the loop" by providing recommendations and accountabilities for action. Use our implementation tool kit. 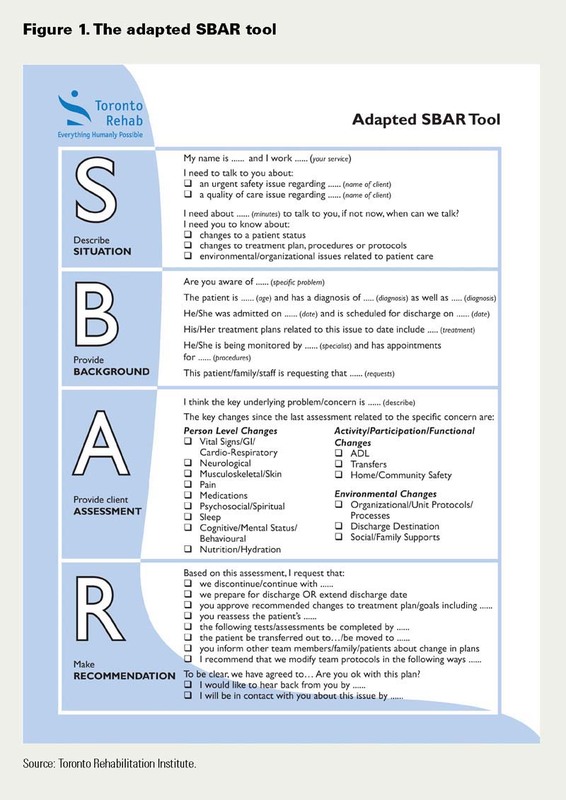 From our previous work, we developed an implementation tool kit for enhanced uptake of SBAR in other healthcare settings. This tool kit is currently in its second edition (Trentham et al. 2010) and includes a video DVD showing SBAR in action. The DVD uses falls prevention and management as a platform to highlight inter-professional team communication in two different scenarios: during team rounds and between two clinicians on the nursing unit. Each of these scenarios demonstrate both ineffective and effective team communication. The accompanying facilitator's guide emphasizes key teaching moments for educators to consider when SBAR education sessions. The tool kit and DVD are available free of charge at www.torontorehab.com/SBAR. We used falls incidence and near-miss reporting as well as severity of falls as proxy measures for safety. While near-miss and total major falls showed a decreasing trend, total falls on the study units increased. It does not seem that SBAR had a significant impact on these measures for a few reasons. First, the data may be trended across a time frame that is too short to determine accurate results and may therefore be inconclusive. Second, the nature of rehabilitation is to push patients to the limits of their abilities in order to maximize function. In this way, the risk of falls and other events are an inherent part of the rehabilitation process. We cannot attribute changes in safety reporting and perceptions of patient safety solely to this study; instead, these changes should be considered within the context of a range of patient safety initiatives at Toronto Rehab. For example, new initiatives regarding leader engagement, upgrades to our online reporting system and a corporate-wide falls best practice initiative have all increased awareness of safety and incident reporting across the organization. We used the 5% rule of thumb to suggest clinically significant change in the HSOPSC; however, this guideline was meant to be used with large sample sizes. We chose to aggregate the study results for a number of reasons, including statistical power. It would also be interesting to look at the study units individually with the specific purpose of sharing key learnings across our organization. The purpose of this study was to implement and evaluate the adapted SBAR tool for use on two inter-professional rehabilitation teams for the specific priority issue of falls prevention and management. Issues of patient safety and communication have been studied in the literature, but usually from the perspective of acute care and involving nurse-physician communication. This study contributes to the literature in patient safety by examining the influence that strong inter-professional team collaboration and communication can have on falls prevention and management in rehabilitation. These results suggest that the adapted SBAR process is an effective way to communicate urgent and non-urgent safety issues and has the potential to be widely used among inter-professional teams. Our next steps are to consider SBAR as one of our organizational best practices and as part of "how we do business". While SBAR has been adapted for use within our setting, it is one of a number of structured team communication tools. Our hope is that these learnings are transferable to other healthcare settings, settings that also recognize the importance (and challenges) of communicating in inter-professional teams. Angie Andreoli, BSc(PT), MSc, is the acting advanced practice leader of patient safety at the Toronto Rehabilitation Institute (Toronto Rehab), in Toronto, Ontario. She can be contacted at (416) 597-3422 x 3984 or andreoli.angie@torontorehab.on.ca. Carol Fancott, BSc(PT), MSc(PT), PhD(c), is the advanced practice leader of patient safety at Toronto Rehab. Karima Velji, RN, PhD, is vice-president of clinical and residential programs and chief nursing officer at Baycrest Hospital in Toronto, Ontario. G. Ross Baker, PhD, is a professor in the Department of Health Policy, Management and Evaluation at the University of Toronto. Sherra Solway, BSc(PT), MHSc, CHE, is the director of patient safety, best practice, and patient care projects at Toronto Rehab. Elaine Aimone, BSc(PT), MSc, is the director of quality and risk services and accreditation manager at Toronto Rehab. Gaétan Tardif, MD, FRCPD, FCCHSE, is vice-president of quality patient care and chief medical officer at Toronto Rehab, and a professor of medicine at the University of Toronto. This project was jointly funded by the Canadian Patient Safety Institute and the Toronto Rehabilitation Institute. American Geriatrics Society, British Geriatrics Society and American Academy of Orthopaedic Surgeons Panel on Falls Prevention. 2001. "Guideline for the Prevention of Falls in Older Persons." Journal of the American Geriatrics Society 49(5): 664–72. Boaro, N., C. Fancott, G.R. Baker, K. Velji and A. Andreoli. 2010. "Using SBAR to Improve Communication in Interprofessional Teams." Journal of Interprofessional Care 24(10): 111–14. Joint Commission on Accreditation of Healthcare Organizations. 2004. Root Causes of Sentinel Events, 1995–2004 (Report). Oakbrook Terrace, IL: Author. The Joint Commission. Leonard, M., S. Graham and D. Bonacum. 2004. "The Human Factor: The Critical Importance of Effective Teamwork and Communication in Providing Safe Care." Quality and Safety in Health Care 13: 85–90. Millward, L. and R. Purvis. 1998. Team Building Techniques – A Critical Evaluation. Farnborough, United Kingdom: Defense Evaluation Research Agency, Centre for Human Sciences. Registered Nurses' Association of Ontario. 2007. Falls Prevention: Building the Foundations for Patient Safety. A Self Learning Package. Toronto, ON: Author. Trentham, B., A. Andreoli, N. Boaro, K. Velji and C. Fancott. 2010. SBAR: A Shared Structure for Team Communication. Adapted for Rehabilitation and Complex Continuing Care: An Implementation Toolkit (2nd ed.). Toronto, ON: Toronto Rehabilitation Institute. Velji, K., G.R. Baker, C. Fancott, A. Andreoli, N. Boaro, G. Tardif et al. 2008. "Enhancing Effective Team Communication for Patient Safety." Healthcare Quarterly 11(Special Issue): 72–79. Westat, R., J. Sorra and V. Nieva. 2004. Hospital Survey on Patient Safety Culture (Publication No. 04-0041). Rockville, MD: Agency for Healthcare Research and Quality. Retrieved January 10, 2009. <http://www.ahrq.gov/qual/hospculture/>.